Today, Monday, June 25, 2018 at 6pm EST, an all-new Project Management Mondays Live (PMM Live) I will cover the role of the project manager. Many people talk about being project managers, but what does a true certified project manager does? In this PMM Live episode, I will discuss in detail what a certified project manager does. 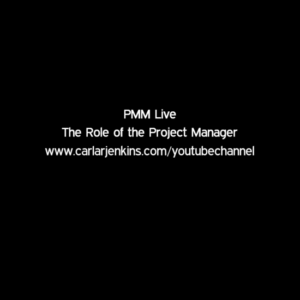 Project Management Mondays Live (PMM Live) is a project management livestream hosted by Carla R Jenkins, PMP, CSM, ITIL every Monday at 6pm EST. Every Monday Carla R Jenkins covers the latest project management trends and topics.